First Listen: Gorillaz, 'Plastic Beach' The latest album by Blur frontman Damon Albarn and comic-book artist Jamie Hewlett is yet another well-crafted and dance-friendly set of glitchy club beats and hip-hop grooves. Audio for this feature is no longer available. The album was released on Mar. 9, 2010. 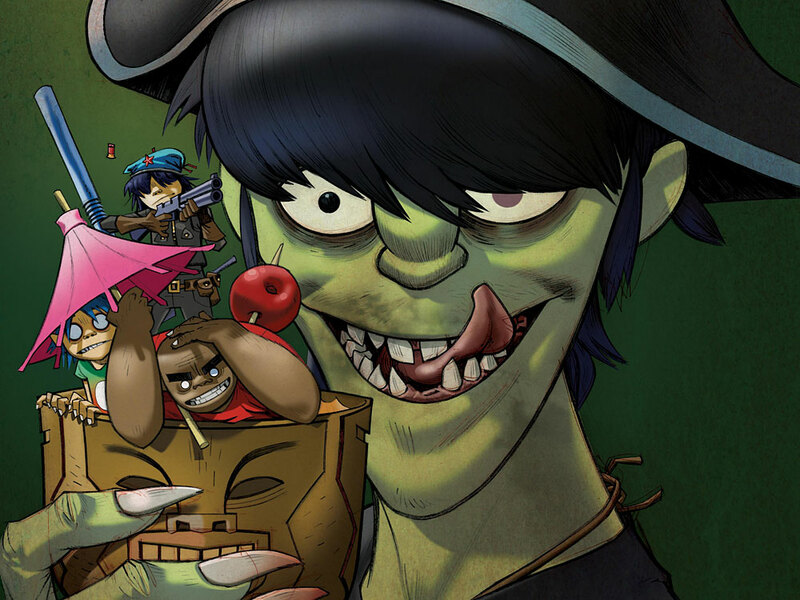 Plastic Beach is Gorillaz's first album in five years. When Gorillaz first emerged on the music scene, the idea of a virtual band composed of edgy cartoon personas that existed only on screen seemed both strange and brilliant. It may have been a gimmick, tailor-made for MTV back when it still regularly played videos, but it was an inventive one. And with huge breakthrough hits like "Clint Eastwood," "Tomorrow Comes Today" and "Feel Good Inc.," it was hard not to get caught up in the contagious combination of dub, hip-hop, Brit-pop and electronic music. Gorillaz is essentially the brainchild of Blur frontman Damon Albarn and comic-book artist Jamie Hewlett — best known for his work on Tank Girl — who dreamed up the project back in 1998. Albarn would handle the music while Hewlett would design the characters (2D, Murdoc Niccals, Noodle and Russel), which serve as the visual element in Gorillaz's stylishly animated music videos. Plastic Beach unites Albarn and Hewlett with a huge list of guests, creating yet another well-crafted and dance-friendly set of songs. Here, Albarn and company's songs demonstrate a genre-bending collection of glitchy club beats and hip-hop grooves, augmented by brass, glitzy synthesizers and Asian- and Arabic-tinged orchestral harmonies. Much of the diversity in sound can be attributed to Gorillaz's constantly expanding group of collaborators. The original musical lineup — as heard on 2001's Gorillaz — blended the talents of Albarn and Dan "The Automator" Nakamura, as well as Kid Koala, Del tha Funkee Homosapien, Cibo Matto's Miho Hatori and Tom Tom Club's Tina Weymouth and Chris Frantz. Soon, with the follow-up Demon Days, Gorillaz's ever-rotating cast expanded to include Danger Mouse, Blondie's Debbie Harry, De La Soul and singer Martina Topley-Bird. Plastic Beach continues this trend, with Albarn bringing in an impressive roster of musical contributors: Snoop Dogg, Bobby Womack, Lou Reed, Mos Def, Super Furry Animals' Gruff Rhys, Little Dragon, The Lebanese National Orchestra for Oriental Arabic Music, and many more. Still, Albarn's musical touch and wit are felt throughout. From the Thriller-infused electro-funk of "Stylo" to the bubbly grooves of "Superfast Jellyfish" and "Some Kind of Nature," there's something for everyone, and often in the same song. Even three albums into what might have initially seemed to be a one-off art project, Gorillaz's Plastic Beach exudes fun. Give Plastic Beach a listen and leave your thoughts on the album in the comments section below.